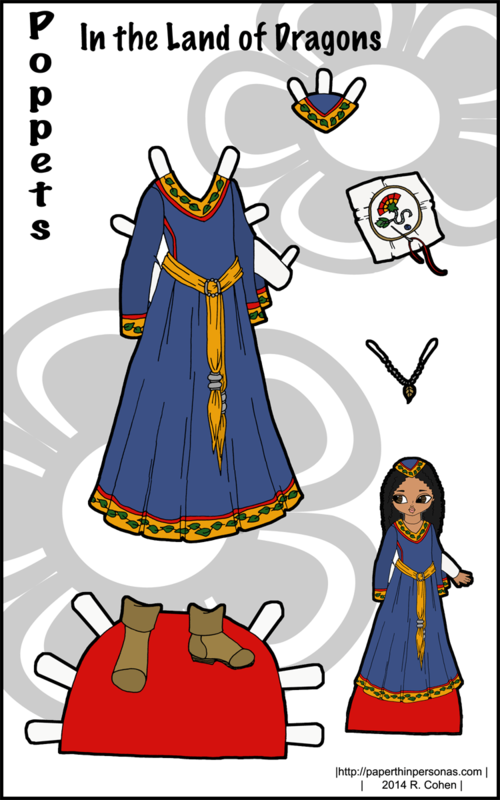 When I first drew the Poppets paper dolls, I knew I wanted to do historical costumes. This isn’t historically accurate by the way, but it does have a 1300s flair, I think. One of the reasons I steer clear of certain periods of history is that I feel like I don’t know enough about them. I am familiar enough with Victorian and 18th century costume that I feel fairly comfortable simplifying it without losing it’s authenticity, but I know very little about clothing in Europe before 1400. As a result, I tend to categorize my forays into the “medieval” look as fantasy, rather than history. It keeps me from feeling guilty about not really knowing what I’m doing. However, Gwendolyn asked for a paper doll of a 10th century Anglo-Saxon when she won my drawing last week, so I guess I better learn something about the 10th century. In the meantime, here’s a Poppet Medieval outfit strictly in the realm of fantasy being modeled by Petunia. I like to think she might be a princess, but I haven’t given her a crown, so the jury is out. The sash is one of my favorite pieces. I think the fun of fantasy dresses is that they are “low” pressure. I don’t need to feel like I might get something wrong and then be called on it or that I might mess up without knowing. As a librarian and a historian, I like historical research pretty seriously, so historical dolls always take more time and care than modern or fantasy dolls. Aw, it’s adorable! I really like the leaf pattern and the way the sleeve falls around the arm of the undergarment. I saw this link on Metafilter and thought of you and your great post with the Native American paper dolls and your thoughts on representation: Native Fashion 101: Not doing it wrong, at least. I found it quite interesting and hope you do too! That is fascinating. I don’t spend much time on Metafilter. Beyond Buckskin (a site in my links page) has contemporary Native designers available in the boutique. 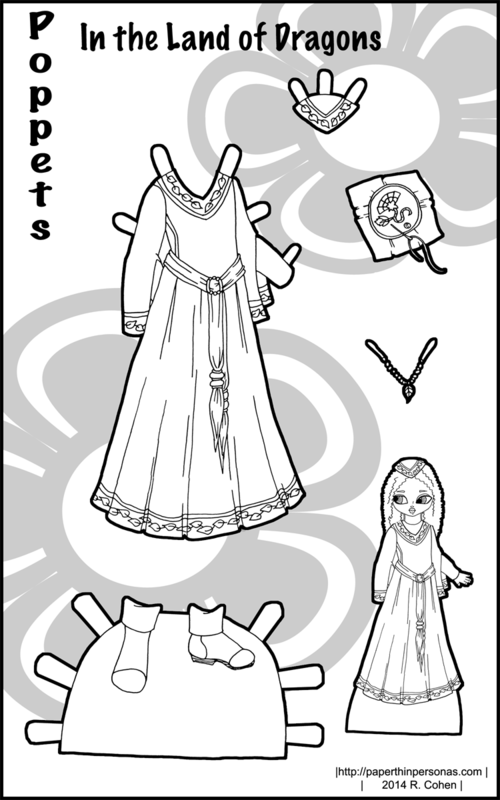 I dream of one day doing a contemporary native fashion paper doll, but I have never done it.